Our man in Golden Lane, Billy Mann, discusses why working to preserve the stories of the past is so poignant in the wake of the centenary of the First World War. The stories we tell about our own lives are the most important ones. The centenary of the end of the First World War served up a feast of stories and voices recently, the best coming from the ordinary people who lived through it. The Imperial War Museum’s Voices of the First World War collection gave us a rare chance to hear at last from those who said nothing for so long after the 1914-1918 conflict. And, in Peter Jackson’s film They Shall Not Grow Old, an army of lip-readers toiled endlessly through silent film footage to work out what the battling young Tommies in the trenches were saying to one another. Here on Golden Lane a small number of residents (myself included) have made a start on our own mission to remember, by gathering the stories of residents, in their own words, in their photographs, and in the curiosities they have collected over the years. Altogether, these often small and seemingly uninteresting things tell us a bigger story. Over at the Barbican Estate they are doing likewise. 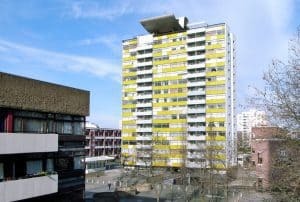 A new archive project just starting in conjunction with the Guildhall School, ‘Laying the Foundations’, aims to capture the history of the neighbourhood and its people. Golden Lane has been invited to join, too, so together we should be able to put post-war home life centre stage. It’s a fair guess that the dusty corners of places like the Guildhall and the Bishopsgate Institute are already well stocked with the testimonies of former Lord Mayors, beadles, sheriffs, and all the rest of the City’s ceremonial grandees. It will be a pleasure to be able to read and hear the memories of residents, office workers, shopkeepers, taxi drivers and police officers. This is where Laying the Foundations promises to fill the gap, by putting real people at its core. 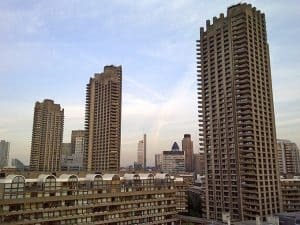 Barbican residents have already got off to a flying start in this ambitious plan. I’m told they have a secret stash of original (1965-76) fixtures and fittings from kitchens and bathrooms. So, Golden Lane has a bit of catching up to do. We already have in our collection a lot of vintage photos and architectural documents. 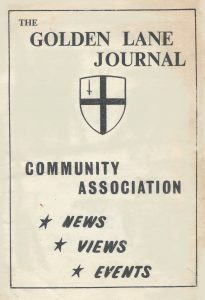 And one or two senior residents have allowed us to copy items from their own personal stock, which contain such gems as old copies of The Golden Lane Journal and Club News from the late 1950s. 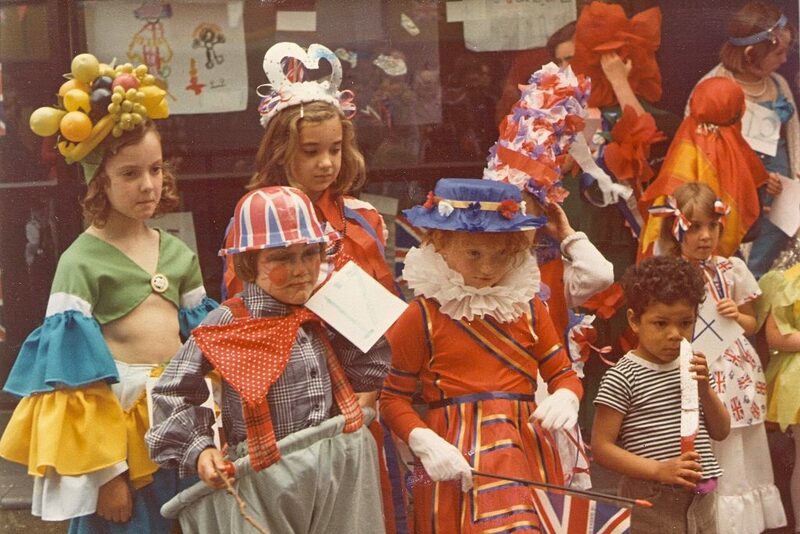 Pictures from 1977 show serious-looking children in daft costumes doing their best to celebrate the Queen’s Silver Jubilee. Letters from locals describing the ground zero they saw when they emerged from air-raid shelters after the war bombing in 1940 put into context the citywide rebuilding of London that our estate was part of. More of these stories will follow, but I especially must guard against my love of tall tales, because they will almost certainly rub up against the archivists’ rigorous codes of practice. Here’s hoping that the sensible people at Laying the Foundations and their partners at the London Metropolitan Archives can steer us in the right direction. A good test for our seriousness is an unpublished memoir we’ve recently got our hands on, by Pat Moriarty, who lived on nearby Whitecross Street from the late 1950s. 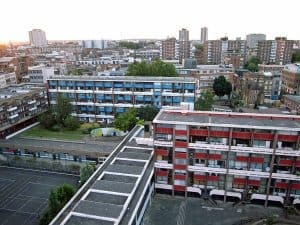 Pat made, and remains, friends with many of Golden Lane’s residents, and her memories of the neighbourhood are vivid and tell a lot about life in the early days of the estate. In one section Pat describes the social progress of graduating from washhouses and outdoor toilets to the fitted home comforts we now take for granted. Good stories are irresistible, and the truth is often dull, but this is the kind of first-person account that gives community history a good name. It is an example worth following. Yes, I am still confident that one day I will crack the mystery of the Basterfield House resident who once slept with David Bowie. And I am itching to talk to the 90-year-old Great Arthur House resident who has a minor obsession with knickers. These stories fuel our imagination and feed our hunger for entertainment, but behind them stand more serious stories about lives lived locally. Not that the 90-year-old can tell us very much at the moment, because recently she accidentally threw away her false teeth. Gum’s the word.